Writing and airports. What do they have in common? I’m sure I could come up with a creative joke, but I’d rather move right on to this writing prompt. For the past few weeks, I’ve been spending a lot of time in, out, and around airports. Those little moments brought lingering thoughts of potential plots and/or characters. Why? Because I was surrounded by new people every second, and getting out of the house can truly clear the clouded mind. This is why I want to talk about “people watching.” I think it’s a commonly used phrase, but if you haven’t heard it before it means exactly what it sounds like: watching people. A lot of people do this for all kinds of reasons: to learn, to recognize behavioral patterns, etc. But I think this is a great opportunity for writers, because writers put a lot of pressure on themselves within their stories to make it as believable as possible (even if it’s completely fiction.) So how do writers get around this conundrum of creating the illusion of fiction seeming factual? We study. We research. We talk to anyone we know who might have experience in the topics or attitudes we want to write about. But what happens when this inspiration runs out, and we get writer’s block? We have to find a way around it. I just took my father to the airport for a trip to Alaska. Traveling is a great way to spark the writing flame too. 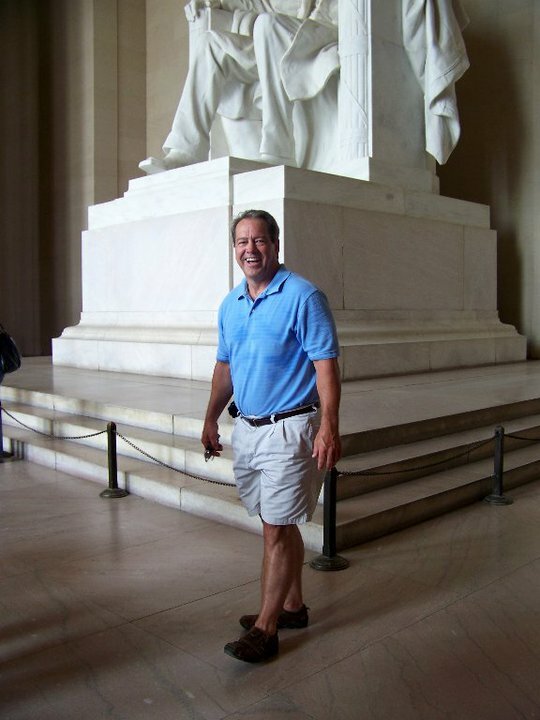 This is from our trip to DC in 2010. 1. Forcing something to happen. 2. Putting pressures on yourself for all kinds of reasons. But I still think we get out of writer’s block by taking a step back and returning to the simple love of writing–or, what I call, the imagination. Airports are full of imagination opportunities: different people, coming and going to who knows where. Possibility excites me, and writing in airports brought a sense of freedom I forget to practice sometimes. In a way, this writing prompt is less about writing in airports and more about switching things up. For instance, if you always write at home, try going to the coffee shop a few days in a row. I say a few days in a row, because it often takes some time to feel comfortable enough with the new area to fall in to the fluidity of writing. This is why I have a journal specifically for traveling. I seem to notice more when I’m traveling, because I’m attempting to take everything in all of the time. Some of my favorite writing is while I’m in moments like this, because I can focus ten times more than I can on a day-to-day basis. So write while your on vacation this summer. Try going to a new place to reignite your passion for the imagination–like an airport or park. You might be surprised–your writing can change, even if only for a moment. I love writing in different locations, can really inspire some good fiction. I completely agree that changing writing “venues” from your usual places can spur creativity. The writing group I belong to, once had us “write someplace you’ve never written before” as our monthly assignment. It was quite amazing to see the sparks of creativity that came about for everyone because of the change. One lady who never wrote for children before, wrote down by the lakeshore, and ended up writing her first children’s book! How cool is that?! That is very neat! Thank you for sharing. I think writers sometimes forget to move around, because we disappear into our own worlds when we write. What arounds us, seemingly, doesn’t matter. But I think switching it up is where your surroundings become important. I’m excited to hear of a writer’s group practicing that! When I get writer’s block, I take a nice, long, warm, relaxing shower. It works EVERY SINGLE TIME. I love that quote, and, actually, I do that too! It helps me take a break, because I often get too wrapped up in things. Like yesterday. I was on the computer 11 hours straight. I’m surprised I can still see. Another enjoyable and inspiring blog! I travel a few times a year, and do have time in the airports, and do enjoy people watching. It has been a long time since I used this time for creative writing, and it is a great suggestion! Thanks, Shannon. I hope that time ends up being an exciting adventure both in travels and writing! You’re welcome. I tend to use the flight time as well for writing. Great blog! This is a cool writing prompt 😛 I think it’s cool that you mention people watching, because I like to people watch because I think it’s interesting and gives me insight on how some different people act in situations. I think almost every writer people watches haha. I agree! I think people watching is one of those prerequisites. Wish it didn’t sound so creepy to those who don’t lol I’ve had that talk with someone before. They didn’t think people would like to watch (or learn) from others that often. Yeah haha, it definitely is when you write, or even want to get better at socializing. Sometimes I feel like as a writer, by people watching and all that, usually it makes you better at socializing with others haha. But yes, it does sound creepy when you suggest an outing at a mall or something, to “people watch” lol. Nice post. I find the airport environment to be a rich source of ideas. I don’t get much writing done at the airport, but I usually leave with notes and a different perspective on certain things. Harry Houdini spent a lot of time on trains when he was touring. He said that long train rides gave him the opportunity to relax, think of new illusions, and further develop his existing ones. Sitting at the bar in Miami airport, I have become a stranger too, along with the those I am watching. Did you knopw that about 5 years ago Heathrow airport here in London, appointed an airport resident writer? He would wander round the terminals and in the working areas, writing down people’s stories. Wow. That’s beautiful. Thank you for sharing. It reminds me of Chris Arnade who currently follows drug addicts around, takes pictures, and writes down their stories. It’s an amazing collection. I’d like to see what the man in that airport wrote down.